AWARDS. Mads Brügger's documentary 'Cold Case Hammarskjöld' and May el-Toukhy's drama 'Queen of Hearts' each took home an award at Sundance Film Festival, and el-Toukhy's praised drama scored a triple victory at the Göteborg Film Festival. The film festivals in Sundance and Göteborg drew to a close on Saturday, both announcing awards for two Danish films, Mads Brügger's 'Cold Case Hammarskjöld' and May el-Toukhy's 'Queen of Hearts'. 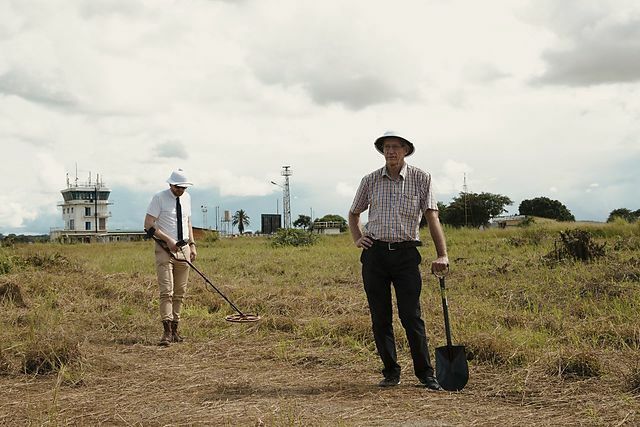 At Sundance, 'Cold Case Hammarskjöld' was announced as the winner of the World Cinema Documentary Directing Award. Brügger's film received much attention at its Sundance world premiere for the sensational discoveries that the director and his Swedish sidekick, investigator Göran Björkdahl, make in the documentary while trying to clarify the mysterious death of UN Secretary General Dag Hammarskjöld in 1961. Brügger has competed twice before at Sundance, winning the Grand Jury Prize in 2010 for 'The Red Chapel'. 'Queen of Hearts' won Sundance's World Cinema Dramatic Audience Award. El-Toukhy's drama, which is the Danish director's second feature, has received enthusiastic reviews – not least for Trine Dyrholm's towering performance as Anne, a successful lawyer who jeopardizes her career and her family when she seduces her 17-year-old stepson. At last year's Sundance, the audience award went to Gustav Möller's Oscar-shortlisted 'The Guilty'. "It takes us down the rabbit hole of our hidden human needs and reveals its characters in the all their rich and dark complexity." Trine Dyrholm received the Best Acting prize for her "powerful performance of astonishing versatility and craft". This is the first time Göteborg Film Festival gives out the award, which is gender neutral and can be awarded to any actor in a film in the Nordic Competition. Finally, 'Queen of Hearts' once again received the audience's recognition, taking home Göteborg's Audience Award. In addition to Sundance and Göteborg, the film screened this week at the Rotterdam Film Festival in the Big Screen Competition. Winner of Best Nordic Documentary film in Göteborg was Anna Eborn for 'Transnistra', co-produced by Denmark's Adomeit Film. Actor Mads Mikkelsen received the Nordic Honorary Dragon Award, which was presented on 31 January. See more at sundance.org and goteborgfilmfestival.se. Danish films have previously won three awards in the World Cinema Dramatic Competition, which ran for the first time in 2005. That year, Susanne Bier received the audience award for 'Brothers.' In 2012, Mads Matthiesen won the best directing award with 'Teddy Bear'. Most recently, at the 2018 edition, Gustav Möller took home the Audience Award for 'The Guilty'. Three Danish documentaries have received the Grand Jury Prize in the World Cinema Documentary Competition: Eva Mulvad's 'Enemies of Happiness' in 2007, Mads Brügger's 'The Red Chapel' in 2010 and Feras Fayyad's 'Last Men in Aleppo' in 2017. In addition, Lise Birk Pedersen's 'Putin's Kiss' and Anders Østergaard's 'Burma VJ' have also been awarded in the category. See overview of Danish films at Sundance over the years. 'Cold Case Hammarskjöld' is written by Brügger, and the film is produced by Peter Engel for Wingman Media. DR Sales is handling international sales. Danish release is 7 February. 'Queen of Hearts' is written by Maren Louise Käehne in collaboration with May el-Toukhy. In addition to Trine Dyrholm, the cast includes Gustav Lindh and Magnus Krepper. The film is produced by Caroline Blanco and René Ezra for Nordisk Film. Trustnordisk is handling international sales. Danish release is 28 March.